Coming off two days of losses earlier this week, markets around the world jumped for joy yesterday at signs of a Santa Claus rally building in the US markets overnight, with the Singapore market all but erasing its losses from the previous session. 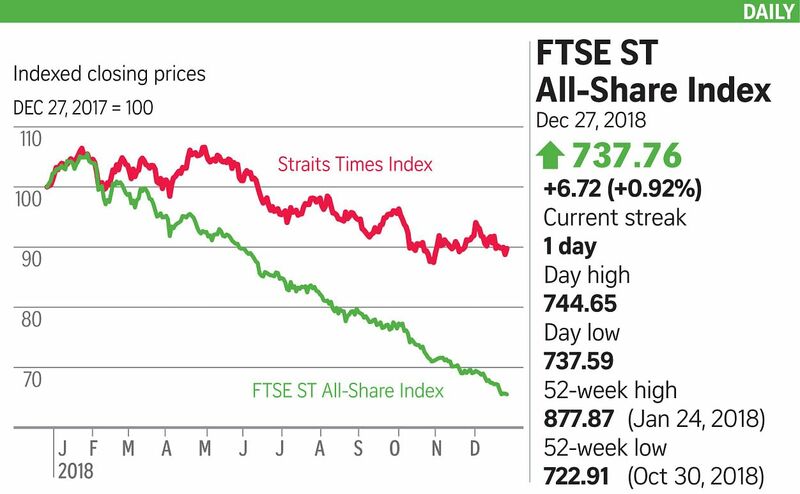 The Straits Times Index (STI) registered a 1.5 per cent rise as it opened and climbed to post almost 2 per cent gains at midday break. It retreated in the course of the afternoon and closed 1.12 per cent or 33.59 points higher, at 3,044.74. Yesterday's showing was a near reversal of the previous day's, when the STI fell 1.3 per cent to 3,011.15. Still, market watchers are holding off their celebrations, preferring to wait and see if the rally continues in the next couple of sessions. Their caution stems from the lack of specific reasons for the US markets' best day in nine years. Some possible contributors were a reassurance from the White House Council of Economic Advisers that Federal Reserve chairman Jerome Powell will not be fired, and a Mastercard report that US consumer spending remains strong with 2018 holiday sales rising the most in six years. Reports that a US government delegation will hold trade talks with Chinese officials in Beijing early next month also factored into the rally, but Mr Stephen Innes, head of trading, Asia-Pacific, at Oanda warned there is no guarantee the discussions can solve the various political and policy issues at stake. Market analyst at CMC Markets Margaret Yang cited lack of macro data and fundamental updates, and short-covering activities as likely main push factors behind the rally. "In the short term, US markets have probably overreacted on a bearish perspective of growth and uncertainties, and cheaper valuation created room for a technical rebound." FXTM chief market strategist Hussein Sayed said: "To call for a bottom, we need at least a couple of days of strength, not just in price, but also in trading volume, breadth of the market, and fundamentally supported environment. " Turnover on the local bourse was about 1 billion securities worth $673.1 million, roughly double the previous day's volume of 490.8 million worth $517.3 million. Gainers outnumbered losers 256 to 155. Most of the 30 STI constituents ended in the black, with just three in the red and two flat. Jardine Strategic Holdings was the biggest percentage gainer, rising 3.62 per cent to close at US$36.65. The biggest loser, CapitaLand Mall Trust, retreated two Singapore cents or 0.88 per cent to end at $2.26.